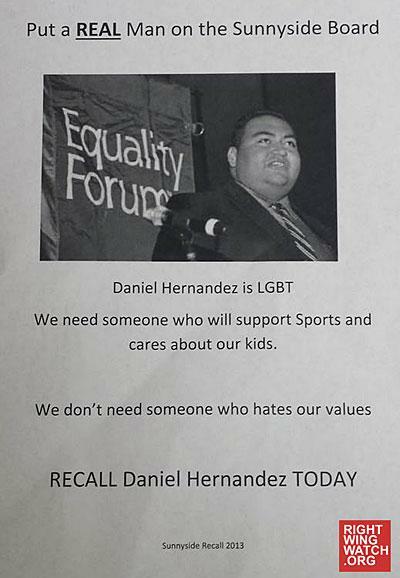 As Right Wing Watch notes, Hernandez is openly gay, and fliers being circulated to constituents attempt to use his sexuality against him, claiming that district families "need someone who will support sports and cares about our kids" and "we need a REAL man on the Sunnyside Board." "We don't need someone who hates our values," the flier continues. Hernandez is aware of the fliers, telling the Huffington Post, "I've had a target on my back from my fellow board members for awhile because I don't go with the flow, and if something doesn't sound right or make sense, I call them out on it. "My governing board president has started the recall process on me, with the people who are his friends and closest allies in the community. I'm not overly concerned they're going to get the 1,300 signatures, but just the negative tone and nature of the way they're doing it has been really bothersome and upsetting," he added. "It's disheartening that this is where we are in 2013, that people think it's okay to put out these kinds of flyers about anybody."